Right off the top I must confess to the lack of fairness of it all. My children certainly can file a complaint of injustice. When my children were young they learned very quickly the iron clad rule – Don’t touch my stuff! Especially off limits were my pens and journals. If they required a writing instrument I could easily get them one from the 7000 pens for $0.99 bag. Now my two year old granddaughter sits beside me while I’m having breakfast. She reaches for my pen and starts a drawing in my notebook. Surprisingly tectonic plates did not shift. The sun retained its course across the sky. The house still stood. Not one of the seven horsemen appeared. When my children were young I was too preoccupied. Understandable, legitimate even. There were contracts to complete, others to win. Money always seemed to flow out faster than in. And with 5 children something always seemed to need attention. I quickly gave up answering, with any seriousness, the question, “How are the kids?” Which one? When? 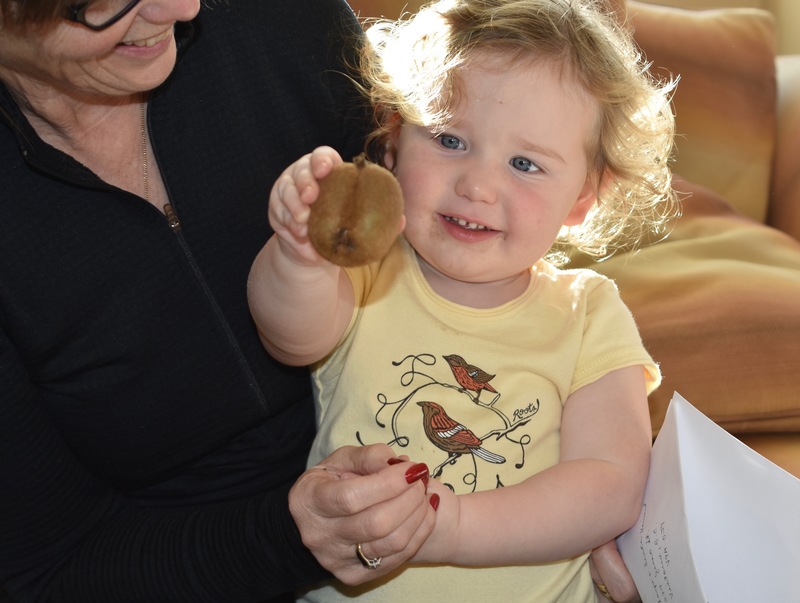 Grandma finds a misshapen Kiwi fruit. “Looks like a bum,” she says. We all laugh. And then spend the next 15 minutes voicing more permutations and enunciations than a Juilliard drama class. It is not that I am without important things to do. They still send me a cheque to work 80% time. I’ve got the blog to develop, social media and online marketing to decipher and I am twisting the quantum theory of spacetime around in my mind like a Rubik’s cube, wondering about the impact of quantum and string theory for traditional views of providence, God and the meaning of life. However, right now, “looks like a bum” seems to take precedence. Was joy always this close? Keith, (I have said this before) your writing is timely, poignant and a quick useful read. I usually, chuckle, pause, think and tear up before I get to the end. Many thanks. Thanks Gordon. I appreciate your response (as always).